As I write, week one of the Fortnight for Freedom is coming to a close here in the United States. Did anyone even notice that the USCCB had decided to stage their yearly patriotic dog and pony show yet again? They can’t help themselves, I suppose. They’re just so… traditional. This is, after all, the fourth annual such nonevent designed by a committee of bishopcrats struggling to convince themselves, against all evidence to the contrary, that the stripped down, emasculated version of the Catholic Church that they represent is still a relevant part of the American landscape. Don’t get me wrong, the Fortnight for Freedom does serve an important purpose; namely, to demonstrate just how little authentic Catholic conviction remains in the post-conciliar church-of-man, and to do so with such stunning clarity that even a neo-conservative nincompoop can scarcely miss the point. 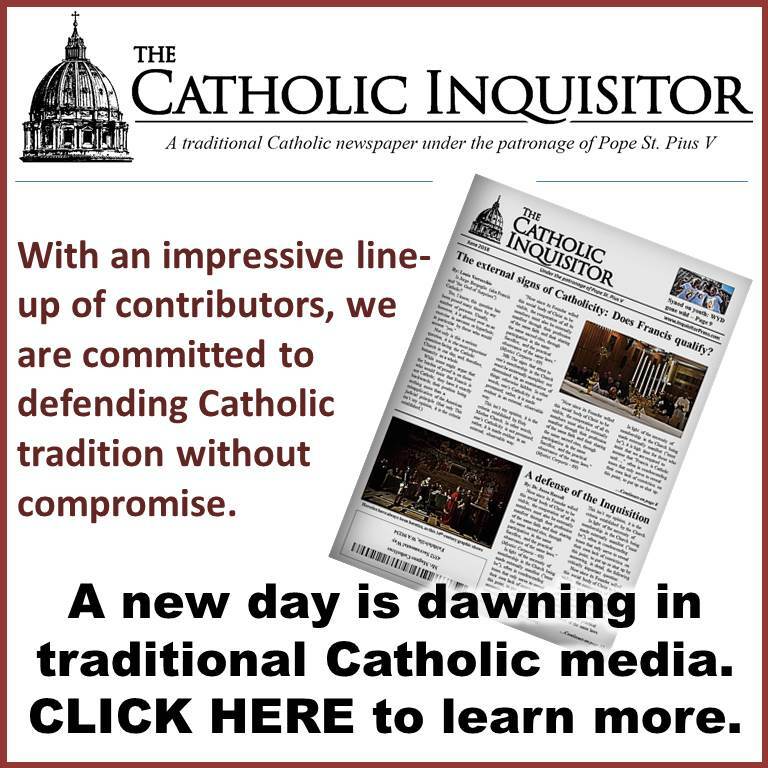 Enter Archbishop William E. Lori, Chairman of the USCCB Ad Hoc Committee for Religious Liberty, who held a webinar on May 28th to announce this year’s version of the fourteen day fiasco. 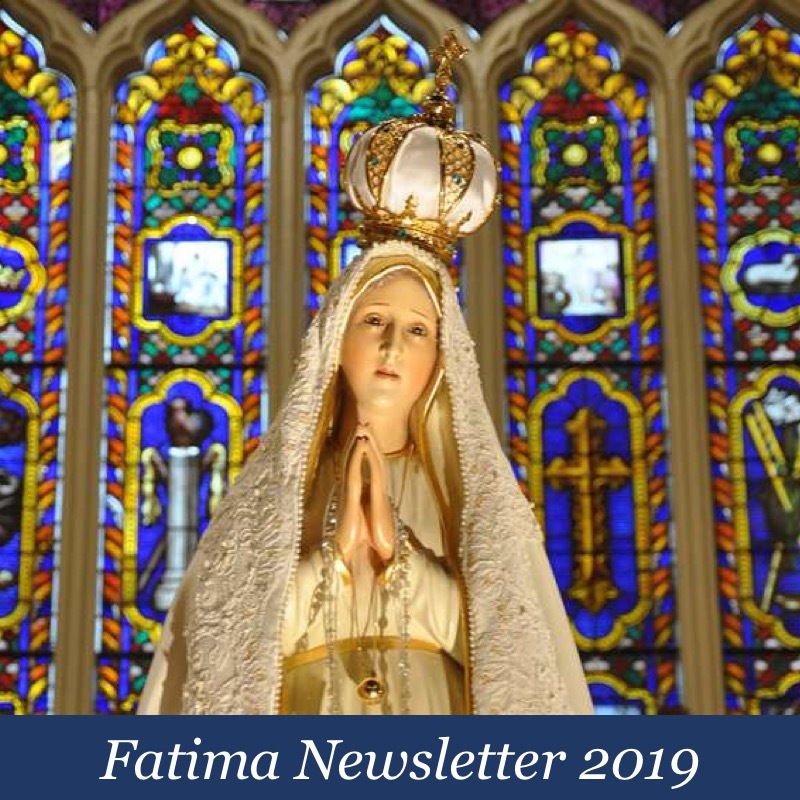 This year’s fortnight observance theme is the “Freedom to Bear Witness,” stemming from the Gospel message that Jesus came to the world to bear witness to the truth, explained Hillary Byrnes, assistant general counsel for the USCCB, who joined the archbishop during the webinar. Well, if not the Faith, at least irony is alive and well in the American Church. All indications are that neither Archbishop Lori, nor his legal counsel, bothered to ponder the actual “message” being conveyed in the Gospel that supposedly inspired this year’s theme. First and foremost, that He is King indeed. Secondly, that He and His kingship are not of this world, but rather, having “come into it” as King, His sovereign authority is in no way subject to the approval of mere men. Lastly, and perhaps most relevantly in the present case, His is the voice of truth, and it is intended for everyone who lives in this world into which He came, in spite of the fact that some will refuse to hear it. Instead, they insist upon a bastardized version of religious liberty that renders no account whatsoever for the Sovereign Rights of Christ the King and the truth that He entrusted to His Church. Pope Francis pointed out that we are truly living in an age of martyrs. I think we have to pay a lot of attention to the sacrifices which people are making for their faith around the world. Many Christians are being persecuted, beheaded. And Muslims are being persecuted for not being Muslim enough. These are men and women of deep faith and deep courage, and as we witness their sacrifice, first of all I think we have to hold up and to highlight what’s happening to them. I’m not sure our leadership is paying enough attention to their sacrifice. As of June 21st and the Opening Mass for the Fortnight for Freedom, that conversion experience had apparently not yet taken place. In the order of magnitude, challenges to religious liberty in the United States do not compare with the outright persecution experienced by many of our sisters & brothers in places like Syria, Libya, Iran, & Iraq. Yet, whether we like it or not, we are in fact in the same boat with those courageous believers. These brave men and women have been dispossessed, exiled, and killed because of their beliefs – whether they are Christians or Muslims deemed not Muslim enough. They are the ones who teach us about God’s precious gift of religious freedom … What solidarity we should have with these believers. I don’t know what kind of “boat” Archbishop Lori is on with those “brave” Muslim “believers” to whom he looks for insight into God’s precious gifts, but I do know this; it sure as Hell isn’t the Barque of St. Peter. It’s like we are living in the Twighlight Zone. When a Catholic hears the word ‘freedom’, the first freedom he should think about is the “freedom from sin”. What the USCCB should inaugurate is a annual day of atonement for Catholic men only. Yes, freedom from falsehood, error, evil, sin. Our freedom enable us to make right judgments and act rightly, or to abuse it by rejecting the moral truth and following the path of evil, and even taking others down that path. Yes, Lynda, we are only free to do good. I wonder if it’s possible to explain that concept to anyone now? We are sojourners in a strange land. Yes. Poor bishops! When they sit down to prepare a speech (Sermon? Please!) they have to get out the template. By the time that’s laid down there are not very many spaces left for ‘just talk.’ Reminds me of the censored letters you would see displayed in an old war movie – most of the sentences would be blacked out with just the odd word here and there left. I’m not an American so I don’t completely understand all the talk about ‘freedom.’ Especially the talk about religious freedom. I thought this meant that we all have the freedom to believe the truth and no one could coerce us into believing a lie. And that as The Catholic Church is the one true Church all are free to believe what she teaches, but that sects and pagan groups had only the freedom to exist and that’s all. I read most Churchmen these days talking about religious freedom to mean every ‘religion’ has the freedom to exist no matter how silly or dangerous it may be. Why are bishops talking like that? Don’t they know what the Church teaches? Someone above mentioned Twilight Zone – remember the one where there are a bunch of people in a church? When they opened the doors all they could see was fog. Nothing else existed. Sounds like today for Catholics. We are in that very small Church and everywhere else there is fog. And billions of newcatholics, sectarians and pagans are wandering out there in it. The new idea of “religious freedom” is anti-truth, and a means to give the state more power by denial of objective truth, and promotion of “religion” as various opinions and beliefs that people like to hold. As such true religion can be restricted and nullified under the rubric of subjective opinion or belief that ought to be kept out of the public square which is controlled by the increasingly-powerful global government and its evil atheistic, materialist, eugenicist, anti-human ideology. And thanks to Our Good Father in Heaven we have wonderful encyclicals from past Holy Popes that explain just how bad democracy and separation of state are. These bishops, along with 99.9999999999999 percent of Catholics in this country hold to the condemned masonic doctrine of religious liberty. That the hierarchy would use the masonic slogan as out battle – flag guaranteed failure from the get go. The traditionalists saw this coming a mile away. Novus Ordo folks are in shock. So sad. 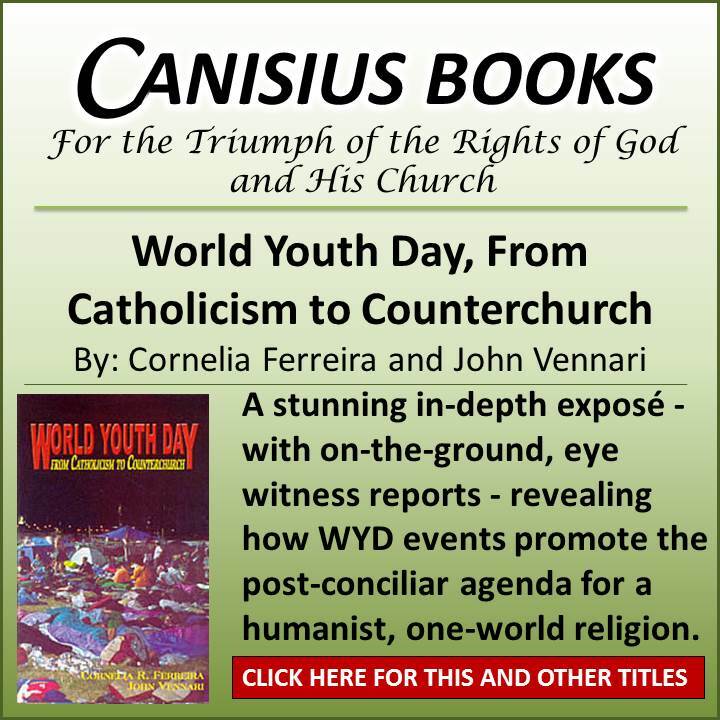 And I heard the folks on catholic radio today praising the global warming encyclical as inspired by the Holy Spirit. You are absolutely correct. Catholics will soon have to decide between apostasy or martyrdom. Hostility towards religion is increasing quickly. Well at least they got half of it right. It was a “Spirit” for sure but “Holy” is was not! “Dog and pony show” is exactly right! I remember tuning into EWTN’s broadcast of the USCCB Conference a few years ago. I could only watch it in brief segments — I guess I have a weak stomach. The opening “hymn” was “Morning Has Broken”. I thought “Come Holy Ghost” would have been more appropriate—but who am I to judge? Also, one of the bishops gave a long and impassioned speech discussing whether a new prayer to be inserted in the liturgy should have a colon or semicolon. It’s a good thing he tackled this issue—otherwise the Catholic faithful would be so confused!!!!! The bottom line is that our shepherds, with very few exceptions, are hirelings! It is interesting to read John Paul II again in light of how far things have gone. He very effectively set the stage by using all he had been taught by the first wave of bad philosophers and theologians who had lost the Faith. Sad to say he’s considered either a guru for neo-catholics, or way too conservative for moderns. Yes. Sad indeed, I’ve been noticing this trend through social media, where he seems to be quoted more and more as a champion of orthodoxy. That’s good, can I steal it? I agree, In Hoc and Barbara. JP2 set the stage–Bergoglio is dancing on it! Bergoglio is JP2 without the mask. Maybe, we should be grateful. No more pretense. This ‘ecumenism of blood’ business is evil. That those claiming to be Catholic shepherds of souls, happily encourage schismatics and heretics in their error, and then herald them as ecumenically-saved because they become victims of vicious and bloody murder is seriously deranged. “For not every sin, however grave it may be, is such as of its own nature to sever a man from the Body of the Church, as does schism or heresy or apostasy. ” Mystici Corporis. The people in ‘Syria, Libya, Iran, & Iraq’ that new ecumenists can’t be bothered ‘gathering with Christ’, were not members of the Body of Christ. They were not ‘sisters and brothers’ in the faith simply because of the awful fact that they were brutally murdered because they were not radical muslims. And what will these traitors say to Our Lord at the moment of judgement when He asks them why they did not go to the wall to bring ALL into His One True Church so they would have a chance of salvation? I remember that sad sack Cardinal Dolan telling a TV interviewer there were certain things the bishops “wouldn’t go to the wall for.” What a travesty of justice and charity these cowards are! They would not go to the wall for anything! Maybe Dolan has a few more “Bravos” for the Supreme Court in this country. Sometimes it would seem the only hope for these men is ‘invincible ignorance’. “Not every one that saith to me, Lord, Lord, shall enter into the kingdom of heaven: but he that doth the will of my Father who is in heaven, he shall enter into the kingdom of heaven. Many will say to me in that day: Lord, Lord, have not we prophesied in thy name, and cast out devils in thy name, and done many miracles in thy name? And then will I profess unto them, I never knew you: depart from me, you that work iniquity.” Matthew 7. What’s necessary for Salvation? Naaaaah, that’s not even on the man’s radar. Who needs that?! That soooooooooooooo pre-Vatican II! Luuuuuuv arising from encounter. We dasn’t forget encounter!!! I can’t help being terribly afraid for Francis and others of like belief. They will stand before Jesus, with His beautiful Face so sad….He will not even say a word because He has said it all…He will just point downward. Then they will curse Him, when now they ‘love’ Him. ‘Christianity’ [according to the ‘gospel’ of Bergoglio] now marches along with every false religion under the banner of the new religion – the United Nations = New World Order or ‘Novus Ordo Seclorum’, as heralded on the greenback. What’s more is that the Vatican publicly makes ‘climate’ the property of marxist ideology. They clearly didn’t bother to consult God on that either. I think that instead of worrying about the earthly outcome of those who practice false religions, who basically worship satan, we should stress the importance of the full conversion and acceptance of the Only True Catholic Faith by those who remain outside of it. We need to get our Catholic priorities straight. The muslims are not MY brethren…..they are deniers of Christ and His Only Church and are therefore surely my enemy. We wish earthly harm on no person but this is secondary to our primary Catholic purpose of leading souls, through the Catholic Faith, to Heaven. Well said. We are given by the Novus Ordo an ‘imagine there’s no heaven’ idea of ‘brotherhood’. But our sisters and brothers are OF THE FAITH. St John warns us not to bless anyone in the name of God who does not profess the true fath and is not within the true fold, because in doing so we are blessing iniquity: “If any man come to you, and bring not this doctrine, receive him not into the house nor say to him, God speed you. For he that saith unto him, God speed you, communicateth with his wicked works.” 2 John 1. Amen. It would be bad enough if v2 didnt stress conversion and denial of false faiths; they actually stress not converting AND the continued adherence of false faiths. Yeah. VII stresses ‘convergence’ with falsehood (the opposite of conversion to God’s truth). 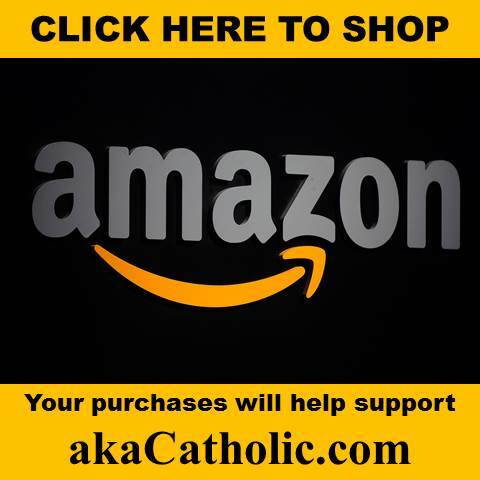 With all of this Apostasy going on, offer your Holy Communion for the Conversion of Pope Francis I and The Bishops to The Preconciliar One True Faith. All the other “Faiths”, all created by MAN, are FALSE. Liberty, a False god, means doing whatever you Want. Liberalism, akin to Liberty, is a Sin. Freedom is doing what you have to and NEED to Do. The Novus Ordo Missae is a Classical Example of Liberty Gone Crazy. Unthinkable Options such as Communion A Mano(In One’s Hand)has led to everything from Disbelief in the Corporeal and Substantial Real Presence of Christ, to desecration of the Same. End “Communion A Mano.” Even better is End This Protestantized Novus Ordo Liturgy, Once and For All. I suppose the root of modern false ecumenism is the denial of the notion of ‘enemies’ of the Church, of the Faith, or Truth — in short, a denial of the Evil One. Unlike the Salve Regina recited in the prayers ordered by the Popes in the 1962 Catholic Roman Misssal, in St. Robert Bellarmine’s brief catechism the Salve Regina ends with the phrase, “Da mihi virtutem contra hostes tuos,” which can be translated as “Give us strength against your enemies.” The enemies we refer to here are the enemies of Our Lady also referred to at Genesis 3:15. I suppose when modernists designate traditionalists as haters it is because traditionalists delineate between the offspring of Our Lady and the offspring of the Evil One. To respond to those modernists, all we have to do is speak logically and clearly: why would our Lord command us to pray for our enemies if there were no enemies to pray for. Well said, Alarico and salvemur. I reckon this can be applied to what happened after the death of Pius XII with the Church. Those who chose to ‘detach’ Faith and Worship from Sacred Tradition, became members of a new entity, with nothing to prevent them ‘authorizing’ all kinds of errors. “Know them by their fruits and avoid them…those impious libertines…also those who hide under the mask of universal tolerance, respect for all religions, and the craving to reconcile the maxims of the Gospel with those of the revolution. These men seek to reconcile Christ and Belial, the Church of God and the state without God.” Pope Leo XIII, Custodi Di Quella Fede. The above in reply to Alarico. It is clear that 90%+ of the Bishops have confused “talk” for “Truth” and “gums” for “guts”. I wouldn’t follow these “shepherds” to a Burger King let alone into any kind of Battle…..unless I wanted to surrender.